Dame Gang Hatches Plan to Purloin Priceless Diamond Necklace in Delightful Spinoff of Crime Caper Franchise! The original Ocean's 11 (1960) starred Frank Sinatra and a tight-knit cadre of fellow Las Vegas headliners affectionately dubbed the Rat Pack by the press. The bawdy band of brothers was famous for partying and making impromptu appearances at each other's shows on The Strip. They even shot the movie right there in Vegas so they could continue working. That buddy flick was remade in 2001 with George Clooney starring as Danny Ocean alongside ten of this millennium's matinee idols. The story was again set in Vegas and also revolved around an elaborate casino heist. The picture was such a hit it spawned a couple of successful sequels, Ocean's Twelve (2004) and Thirteen (2007). Ocean's 8 may trade on the Ocean name, but this novel spinoff represents a refreshing departure for the testosterone-fueled franchise. Besides featuring an all-female gang, the film is set a world away from gaudy Las Vegas amidst New York City's Jet Setters. At the point of departure, we're introduced to dearly-departed Danny Ocean's little sister Debbie (Sandra Bullock) as she does her best to convince a New Jersey parole board that she's nothing like her con artist brother. But no sooner is Debbie let out of the slammer than she's embarking on a brazen shoplifting spree at Bergdorf Goodman's and duping a desk clerk at a luxury Manhattan hotel into giving her a key to a suite. Next thing you know, she's masterminding an elaborate plan to purloin a priceless diamond necklace during the Metropolitan Museum of Art's annual costume ball. 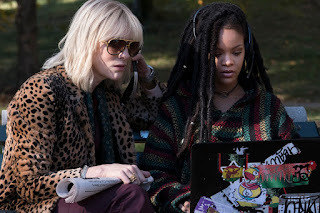 Debbie begins by recruiting a crack team of cohorts, starting with her longtime partner in crime, Lou (Cate Blanchett). The rest of the motley crew is composed of hi-tech whiz Nine Ball (Rihanna), jeweler Amita (Mindy Kaling), fashionista Rose Weil (Helena Bonham Carter), big screen diva Daphne Kluger (Anne Hathaway), ex-thief coaxed out of retirement Tammy (Sarah Paulson), and Constance, a trash-talking crook played by the scene-stealing comedienne, Awkwafina. The real fun starts after the get acquainted phase of the adventure, when the conspiracy is put into action in and around the museum. Besides, a super cool caper, we're treated to a profusion of enough blink-and-you-missed-it cameo appearances to take your breath away. Dozens of celebrities attend the marvelous Met gala, including Katie Holmes, Kim Kardashian and her sisters Kylie and Kendall, tennis pros Serena Williams and Maria Sharapova, Vogue editor-in-chief Anna Wintour, and designers Tommy Hilfiger and Alexander Wang, to name a few. 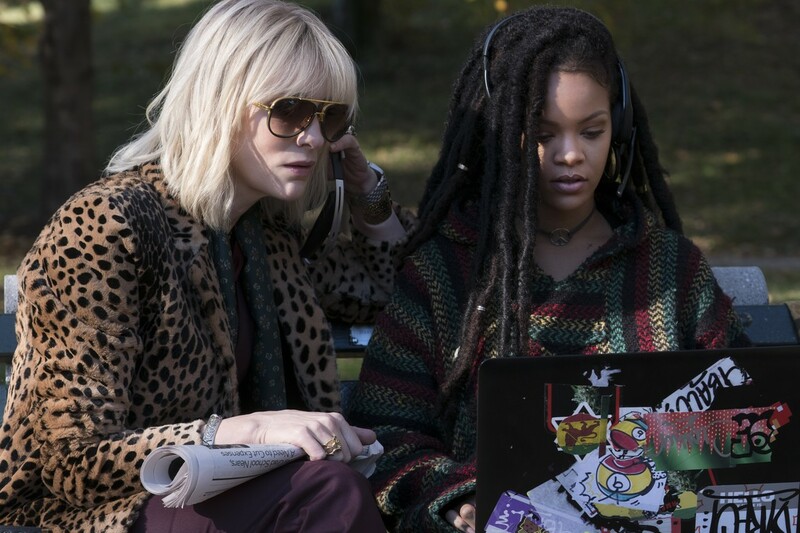 Ultimately more lighthearted than edgy, Oceans 8 is a fashion-driven, fun-filled affair where all the flair and famous faces serving as backdrop practically upstage a perfectly-delightful, female-centric crime caper.